Price Chopper Weekly Ad Specials. 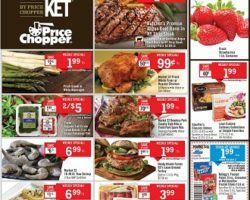 Get this week Price Chopper Ad Flyer & sale prices, grocery coupons, current circular savings, promotions & AdvantEdge Card offers. Most Price Chopper locations have a Pharmacy staffed with caring professionals. With Golub Corporation as its parent company, one that traces its history back to the year 1900, Price Chopper has developed into a successful chain of supermarkets, today operating over 140 stores in big cities such as New York, Vermont, Pennsylvania and Connecticut. Price Chopper Supermarkets started out as a small shop selling lunch items and dairy products before developing into a wholesale grocery warehouse in 1922. The business ventured into the food retailing landscape stocking stores with new product lines, anything from staple groceries and dry goods to home appliances and clothing items. Today, Price Chopper stores offer a big selection of groceries and also include personalized services at their pharmacy locations, filling prescriptions and administering vaccines being two of their service offerings. Aside from coupons offerings, savings on fuel purchases, and the AdvantEdge card savings, the Price Chopper weekly flyer as well provides cutting costs opportunities with items featuring special prices and further discounts.